BSPHCL Various ITI Post Final Result Qualified List Check Here. BSPHCL Various ITI Post Final Result Pending List Check Here. BSPHCL Various ITI Post 2018 Answer Key/ Objection. BSPHCL Re Exam Admit Card 2018 Check Here. BSPHCL Various ITI Post Admit Card 2018 Check Here. BSPHCL Notification is out. BSPHCL is recruiting for 2050 Various ITI Post 2019 Posts. You can check BSPHCL - Bihar State Power Holding Company Limited last date, download BSPHCL notification, visit BSPHCL official website and check other BSPHCL Vacancy details.Complete Vacancy and recruitment Details about 2050 Various ITI Post 2019 vacancies in BSPHCL are provided below by JobSarkari.Com only for you. Last Date for Apply Online 08/10/2018. Last Date for Payment of Application Fee 08/10/2018. Last Date for Online Correction in Application Form 10/10/2018. General / OBC / EBC / Other State Rs.1000/-. SC / ST of Bihar and PH Rs.250/-. Mode of Payment Application Fee Can be Submitted through Online Mode Only. 150 99 48 03 300. Switch Board Operator II 500 330 160 10 1000. Junior Line Man 250 165 80 05 500. Technical Grade IV 125 82 40 03 250. Total No of Post 1025 676 328 21 2050. Candidate Must Have Passed Class 10th With ITI in Electrician Trade. Maximum Age for Male 37 Years. Maximum Age for Female 40 Years. 7. Online Application Can be Submitted on or Before 08th October 2018. Q. 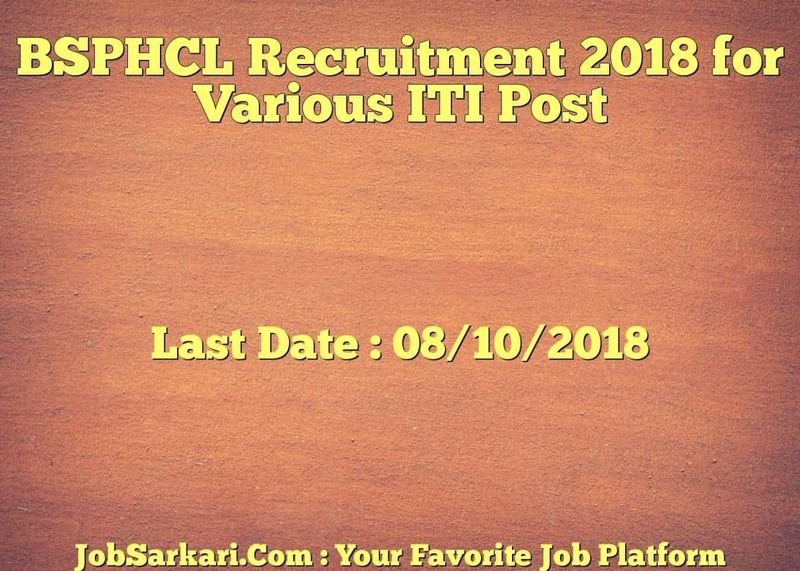 What is the Last Date For BSPHCL Various ITI Post 2019 Vacancy ? A. 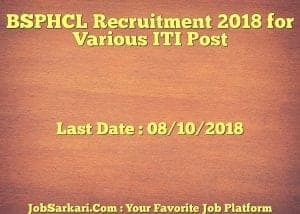 Last Date for BSPHCL Various ITI Post 2019 Posts is 08/10/2018. Q. What is the Form Type of BSPHCL Various ITI Post 2019 Recruitment ? A. The Form Type for BSPHCL Various ITI Post 2019 Posts is Online. Q. How many vacancies are available in Bihar State Power Holding Company Limited Various ITI Post 2019 Posts ? A. There are about 2050 Vacancies in Bihar State Power Holding Company Limited Various ITI Post 2019 Posts.